Ah, Jean Sibelius (1865-1957). His music is magic. Where would his music have gone had he not received at a fairly young age a lifetime pension from the Finnish government to compose, with seemingly few strings attached? Would he have kept to his sort of post-impressionist, post-romantic style, as he did over his lifetime? Who knows. I do not. It is difficult to imagine Sibelius being something other than who he was. I will admit that it took me some time to appreciate how singular and wonderful that is, especially in my younger years when I was expecting all modern composers to be...overtly modern. So now I can say that Sibelius is essential, to me at least. His symphonies, his Violin Concerto, his orchestral work, the "Lemminkäinen Suite (Four Legends from the Kalevala)," the major tone poems, all wonderful. And then there are other less-known miscellaneous works of his. 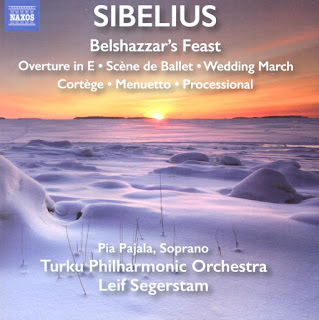 You can hear some of them very respectably performed on the new release Belshazzar's Feast (Naxos 8.573300) by Leif Segerstam and the Turku Philharmonic. It is a mix of fascinating music created mostly in his younger years. The "Overture in E major" and the "Scene de Ballet," both from 1891, are apparently what were his first efforts, the first two movements for an inaugural symphony that he never completed. They are in some ways more Sibeliusian than his actual "First Symphony," at times, the actual first having more of a Tchaikovskian feel now and again. The central work on the collection is the title piece, "Belshazzar's Feast" (1906). It is a multi-movement suite of incidental music composed for the play of the same name, written by Sibelius's friend Hjalmar Procope. 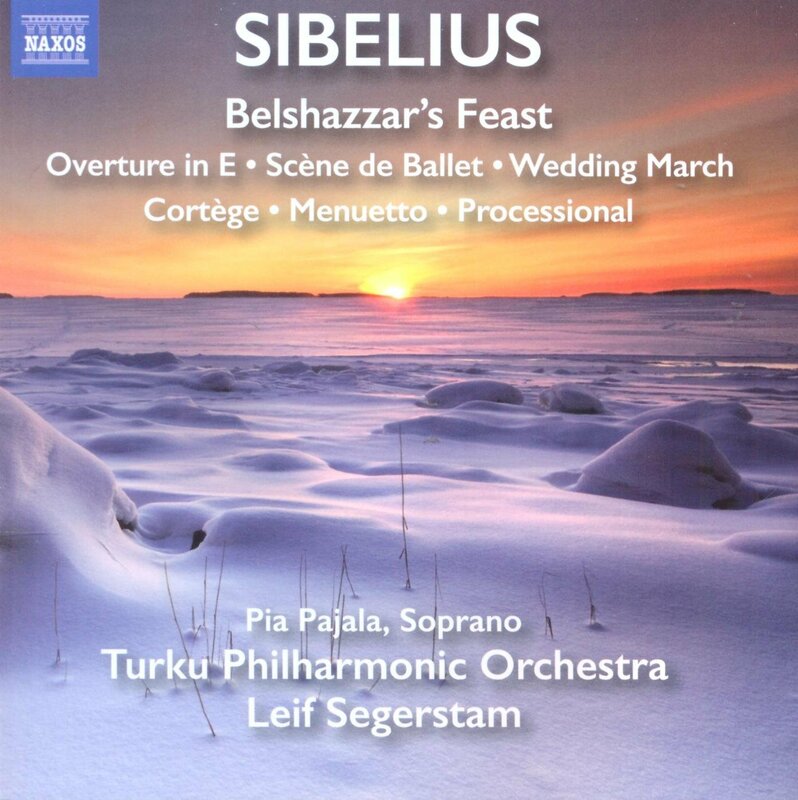 It has much charm and a goodly amount of the hallmarks of Sibelius at his best. To complete the program are four other brief pieces written between 1894 and 1938, one-off orchestral works that are perhaps not masterpieces but gratifying to hear for anyone who admires the composer and his ways. And in that this collection will be cherished by Sibelianites. It is probably not the album to start with if you don't know Sibelius well. For that you should probably begin with the Violin Concerto and/or the Symphonies (three and on). Nonetheless this is a charming set that at the Naxos price is hard to beat. I have discovered to my delight that Grazyna Bacewicz (1909-1969) was more than a merely very interesting Polish modern composer. Her string quartets are brilliant. Happily Naxos sent me their first volume, Complete String Quartets 1 (Naxos 8.572806) as played with care and great understanding by the Lutoslawski Quartet. And a few listens later I come on the blog to express my satisfaction and even amazement with the results. The inaugural CD includes her Quartets 1, 3, 6 and 7, covering the long period from 1939 to 1965. Each one is a gem, holding a sort of middle ground between Bartok and Ligeti, and doing it so well, so much with her own special integrity. I am almost at a loss for words. "A progressive composer would not agree to repeat even himself," she remarked in 1964, and that is very much true of the quartets. She takes on neo-classicism in the delightful First Quartet and then proceeds to give us a very personal form of expressionism, serialism and beyond in the later works. All have a special structural integrity, a sense of form that lights up the part writing, gives us motivic originality and a discursive flow that pours out in streams of exceptional illumination. She does not repeat herself. She follows that maxim so that each quartet occupies its own realm in the most modern and poetic ways. I should qualify that to say that my reactions are based of course on the four quartets included in Volume One, but I can scarce imagine that Volume 2 will be anything but an affirmation when it comes out. The sound is pristine and well defined. The performances are world-class. And the music is unparalleled. What else need I say? I am stimulated to hear much more of Bacewicz's music as a result of this disk, and of course I await Volume 2 with keen anticipation. I recommend the first volume to connoisseurs of the string quartet and anyone interesting in 20th century chamber music. Do not hesitate! 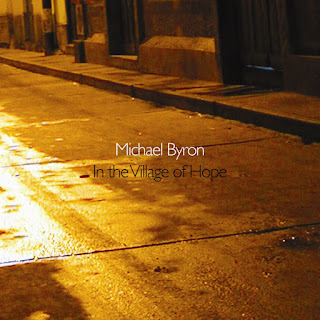 Michael Byron composes in a radical tonality realm, producing music that has a sort of natural, processual feel to it. Several of his albums were favorably reviewed on this blog in 2014. Type his name in the search box for those. Today we have another, In the Village of Hope (Cold Blue 0043), an EP containing the title track, a single-movement work for solo harp lasting some twenty-odd minutes. Tasha Smith Godinez performs the work with distinction. There are dual contrapuntal parts that continue throughout, in diatonic and sometimes pentatonic modes. The rhythmic, nature-inspired complexity of the two parts working together may call for two separate harp tracks, I am not entirely sure, but it makes no difference to the music, which is organic and endlessly fascinating. I just heard in from label head Jim Fox. The harp part is played with two hands in real time. That is difficult and some feat! The brevity of the work leaves you with just enough to convey an acoustic impression and a mood of tranquility and hopefulness. The sound of the harp has those sorts of connotations, at least for me, and the music does much to reinforce and underscore a peaceful yet dynamic experience. In the end Michael Byron gives us a very satisfying work, a living, breathing cornucopia, a significant brush with music-as-nature, beyond the usual human restructuring. It is a delightful listen that I gain something from each time I hear it. If you are open to a new adventure in sound, this will doubtless provide you with much pleasure as well. Three fine quartet works from the early 20th century by composers known more for their work in other configurations? That would aptly describe the Skyros Quartet's Introspective Odyssey (Navona 6005). The ensemble gives us luminous, first-rate performances of Benjamin Britten's "Three Divertimenti" (1936), Josquin Turina's "La Oracion del Torero" (1925), and Jean Sibelius's "String Quartet in D Minor, Op. 56, 'Voces Intimae'" (1909). All three works have not necessarily been in the spotlight much in recent times. The Turina is brief, flamenco inspired with impressionistic touches, very delightfully direct. The Britten work is from his student days, but shows us a composer already well on his way to developing a personal, very original voice and gives us a good early view of what was fast-becoming his tempered modern outlook. The Sibelius, as so properly and subtly done by the Skyros Quartet on this recording, shows us especially well the intimate, reflective side of Sibelius, already moving from romanticism to Sibelius's own inimitable blend of impressionistic and post-impressionistic sound worlds, to the special Northern-European style he constructed out of a combination of personal lyrical inspiration and the folk echoes of his native Finland. To hear all three of these works so well done is a rare treat. 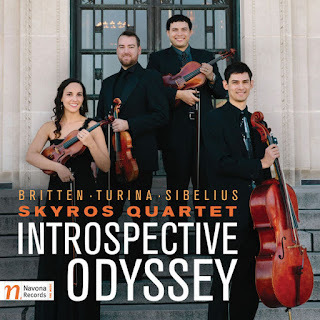 The Skyros Quartet make more of the music than some others have done. They take to each piece with a ravishing, articulate, sonically appealing approach that has passion more than sentiment, fully coherent phrasing and a sort of introspective reading that is true to the album's title. They give you plenty of reasons to appreciate the works anew. For all these reasons I applaud the Skyros Quartet heartily. These are performances for our times. The music speaks readily and eloquently. Recommended! There has been of late a luxurious flowering of contemporary Chinese classical composers who are reaching Western modernist ears. One of the best is Xu Shuya (b. 1961), based on his recent collection of orchestral works in the volume Nirvana (Naxos 8.570617). Born in north-east China, he graduated from the Shanghai Conservatory of Music in 1983, quickly becoming a faculty member. He then went to Paris, got his masters in composition with distinction from the Ecole Normal de Musique de Paris in 1989, went on the receive the 1992 Premier Prix in composition from the Conservatoire National Superiore de Musique et de Danse de Paris, where he studied with Ivo Malec and participated in Master Classes with Stockhausen, among others. He then attended IRCAM as a doctoral student. Such were his auspicious beginnings. He has amassed a sizable number of compositions, five of which we hear in the collection at hand, as performed ably and spiritedly by the ORF Vienna Radio Symphony Orchestra under Gottfried Rabl, with Shu-ying Li and Qilian Chen as the soprano soloists. The works presented here cover the years between 1992 and 2014. They show Xu Shuya as a very inspired writer of orchestral music in a late high modernist style. If you listen carefully you will hear at times the influence of Chinese traditional music in his use of space (and in "Yun" a melodic affinity) but generally this is music that embraces the internationalist realm of advanced sound color collages, an architectonic sense of note clusters that often dwell somewhere beyond conventional tonality, and a sort of interplanetary sprawl of avant sound events that retain a distinct identity while still belonging to the advanced school of the avant orchestral approach. In addition to the title work "Nirvana" (2000) we get to hear "Insolation" (1997-2014), "Crystal Sunset" (1992), "Echoes of the Old Country" (1993) and "Yun" (2007), the latter of which features nicely the two sopranos. There is a great deal to absorb and appreciate in these works. 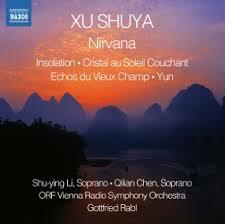 Xu Shuya has a finely vivid orchestrational and evenamental feel that comes out dramatically. Anyone interested in high modernism and contemporary Chinese composers will gravitate toward this volume. It is well done on all fronts. Careful repeated listens bring you satisfying rewards! A collector of recorded classical music, modern or otherwise, is a particular sort of person, someone out of the ordinary. I suspect the avid collector of such things would not find "streaming" very satisfying. That is in part because a physical collection, whether CDs, LPs or what-have-you, has an aura about it. It expresses the collector's musical personality. Visiting avid collectors over the years, I have always been impressed by the display of what the person has. It is impressive first off by the sheer mass and the way it is organized, like books, ordinarily in a series of horizontal stacks. Someone who has a great deal of, say Beethoven, will most likely group them together in some fashion, so that of course the collector can easily retrieve a particular item at will for listening. But also because the interested visitor can gauge the extent of the holdings of particular sorts. "Wow, look at all the Beethoven!" one might exclaim on seeing it all grouped together. Now this transactional accumulation as an extension in space is not peculiar to music collectors. When I was studying anthropology in Chicago I did a research presentation about a tribe in Highland New Guinea and their pigs-for-yams exchange festivals. There was an open ceremonial ground where each exchanger was allotted a vertical row. Every time a "big man" initiated an exchange he was awarded a stake. The winner of the sequence, the biggest man was the one with the longest line of stakes. The stakes were a projection of the status of the winner, the one with the longest projection into space of self if you like. Why collectors will probably never be satisfied with streaming has to do with that physical presence of albums. They have the very concrete accumulation of endless stacks as the visual correspondent of their commitment to have much music in their lives. It gives them status as collectors and it shows anyone who looks what kind of music lover they are. Like anything that takes up physical space, though, there is a point where the collector must make choices. How much Beethoven do you need? At what point do you stop? 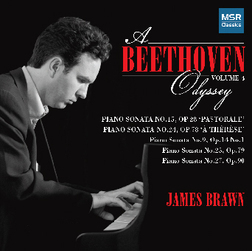 With that long introduction I introduce Volume 4 of pianist James Brawn's A Beethoven Odyssey (MSR 1468), comprising eventually a complete recorded set of Beethoven's monumental series of Piano Sonatas. Anyone who knows the last 100 years of classical music recordings knows that there are fair number of such complete recordings, some with great pedigree, others less so. I have musically dwelt in the realms of a number of them. Almost all of them have something about them that sets them apart. Some are hard charging with romantic supercollider thrust, even at times to the point of sloppiness, some seem especially good for the later, most celebrated sonatas but do not give the lesser-known works as much care and attention. So what sets James Brawn's set apart, so far? He performs every sonata observing all repeats, for one thing. This in effect makes every sonata stand out as a significant effort on Beethoven's part. It equalizes in part the relation of the bonifide "masterworks" with the lesser-known, allows the listener to contemplate each in its own right. The volume 4 contains sonatas nos 15, 24, 9, 25 and 27. And like the other volumes in the set each is given a very well-balanced reading, warm and dynamic as called for but also with a classical feeling of balance between the affective and the intricately brilliant structure of each work. In this way, then, Sonata No. 9 is not a preliminary to the later, more innovative sonatas. All are performed with care, with an execution technically proper and musically sound, expressive of where Beethoven dwelt musically at each point in time. James Brawn, so far in the cycle, gives us the sonatas in readings that seem right for the times we live in. They are not unmindful of the contrasts and dynamics as Beethoven must have imagined them in performance, but they are not the super-romantic potboilers of yesterday, wearing heart on sleeve for an audience that demands grandstanding. So if all goes according to plan the final complete set gives us a Beethoven for our contemporary-modern sensibilities, fully mindful of the lyrical and structural, the impassioned and the balanced, without overdoing any one element. So in answer to the collector's worry about when to stop accumulating complete Beethoven piano sonata recordings, my answer would be that the Brawn set is so nicely unassuming, so true to bringing out Beethoven in all his glory, that you probably should have it, even if you already have a number. For the novice, too, this is a nice one to learn the ins and outs of the complete Beethoven for piano. I do recommend it. Brawn gets inside Beethoven as we would wish to hear him today. Bravo! Of all the 20th century composers for the piano, Kaikhosru Shapurji Sorabji (1892-1988) is no doubt the most Promethean. The liners to the CD at hand today make mention of some 90 hours of solo piano music he wrote in the 65-year period beginning in 1917. His "Symphonic Variations" alone requires nine hours for performance. The "100 Transcendental Studies" in comparison requires seven hours to perform in its complete version. His music is sprawling and quite demanding, like the Charles Ives of the "Concord Sonata" only more prolonged and intense, or a mad-scientist expansion and extension of Liszt at his most difficult. The music has a rubato, extraordinarily expressive approach, very chromatic and at times at the edge of tonality. Playing Sorabji properly requires a special virtuosity and an interpretive commitment few pianists are willing or able to make. 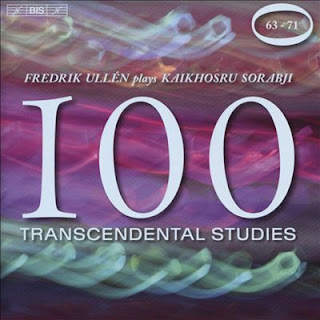 Fredrik Ullen most certainly is singular on both fronts, as one hears readily and astonishingly in his ongoing recording of all 100 Transcendental Studies, the latest volume covering Nos. 63-71 (BIS 1851). All 100 studies were composed between 1940 and 1944. The later pieces especially are sometimes far longer than a typical etude, with eight or nine parts sounding simultaneously at times, with dense and intense passagework going forward at great lengths, exhaustingly. Ullen responds with a superhuman effort. The music in this volume gives you Sorabji at his most wonderfully eccentric--a post-Scriabin on steroids, with heroic cascades, avant torrents from a never-ending inventive fountainhead. They are some of the more incredible piano works written, all told, even though we are hearing only nine of the 100. Fredrick Ullen brings out the expressive clout and high passions of the music with a brilliance it is hard to imagine realized by anyone else to this extent. It is music of an overwhelming power. Even if you know something of Sorabji the composer, this volume will surprise and I think delight you. Newcomers will find this a bracing listen, too. It is some incredible music! Highly recommended! There are new composer-voices out there. Some reach my ears and move me. Others I may not be exposed to for whatever reason. It is a good time, though, to hear new music if you are in a position to do so. 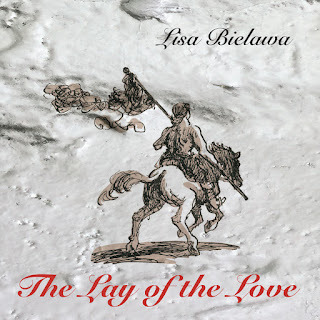 Lisa Bielawa is an excellent example of a worthwhile present-day composer whose music has now reached me and fortunately so. Her album of recent works, The Lay of the Love (Innova 915), has been spinning around on my CD player for about a week. It has gotten my attention and so today I say a few words about it. In all, three works fill the album. A song cycle, "The Lay of the Love and Death," "Hurry," for soprano and chamber ensemble, and the small-scale chamber work "Wait." Ms. Bielawa has for one thing a great talent in evidence on two of the three works presented: she is a natural in setting poetic texts to music. In that she reminds me of Benjamin Britten and Alban Berg, not in terms of the sound of the music, but in the organic inevitability of vocal line and the music built around it--and the expression of poetic mood in aural terms. That latter is true of all three works, since they are all text-based in one way or another. You can hear this on the opening song cycle "The Lay of Love and Death," for baritone (Jesse Blumberg), piano and violin. It is based on an early epic poem by Rainer Maria Rilke, who composed the verses around the life story of a putative (apocryphal) ancestor of his who at age 19 fought and died in the war with the Hussars in the 17th Century. The thin book containing the poem was read widely by German soldiers on the front lines in WWI. Thousands of slain soldiers were found to have a copy of the booklet-poem in their pocket. Bielawa brings excerpts from the epic (translated to English) to poignant life, capturing the youthful ardor and pathos of the main character with a ponderous reflectiveness, an instrumental brilliance and vocal expressivity that has a timelessness built out of a combination of archaic and modern musical elements. It is music of originality, with vocal passages intertwining with instrumental interludes in enchanting, touchingly memorable ways. "Wait" is one of four interrelated pieces that each dwell on specific excerpts from Nabokov's English translation of Pushkin's "Eugene Onegin." The violin part is a quiet drone that sets the table for the modern yet rather primal piano part. If this is postmodernism, and I suppose it can be called that, it is both more open in an early modernistic way and yet somehow redolent with an ancient quality. Finally there is "Hurry," a chamber work for five instruments and soprano (Sadie Dawkins Rosales) realizing beautifully a poem by Boris Pasternak on the transformative magic of song. The music underscores Ms. Bielawa's lyric brilliance, the ease of interaction between poetic text, vocal line and instrumental part writing. Like her other works on the program, there is a striking confluence between classical-modernism--and its meaning-image as seen through a prism of both the present and the archaic past. The performances are excellent, worthy of the musical singularity that is Lisa Bielawa the composer. The Lay of the Love stands on its own as some outstanding contemporary chamber music. It also whets the appetite for further exposure to her music. I find myself very much looking forward to hearing more. I suppose that is a sure sign that the music has reached me. It has! I do recommend you get a copy of this, especially those who respond to the vocal-chamber nexus in contemporary classical. Ravishing. 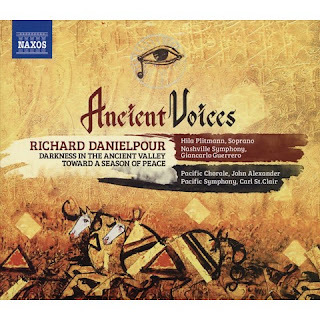 Composer Richard Danielpour comes into prominent focus with two ambitious orchestral and orchestral-choral works on the new 2-CD set Ancient Voices (Naxos 8.578311-12). "Darkness in the Ancient Valley" is a "Symphony in Five Movements" from 2010. It features the Nashville Symphony under Giancarlo Guerrero with Hila Plitmann as the soprano soloist. "Toward A Season of Peace" (2011) is for the Pacific Chorale and the Pacific Symphony, directed by John Alexander and Carl St. Clair, respectively. Both relate to each other thematically. The "Darkness" Symphony concerns itself with the state of things in Persia in 2010 and the hope for continued reforms there. (Danielpour is of Persian ancestry.) "Toward A Season of Peace" is a heartfelt wish for peace in the Middle East. Both works are stirring and at times somber, at times impassioned, at times reflective. They do make use of musical elements from the region, but often enough the music is contemporary-tonal in a modern 21st century way. There is rhythmic vitality, melodic singularity and excellent use of orchestra and choral forces. Danielpour has become a voice unto himself. The music is rousing and effective. If its release happens to come at a delicate time for the diplomacy issues that are under review by some in the USA, it is of no relation to this fine music. And who of us does not wish for peace? I hope very few. It is with that thought that I recommend this music to you. It is extraordinarily well performed and masterfully scored and conceived. When I think of American composer Quincy Porter (1897-1966) my mind involuntarily associates him with the painter Fairfield Porter (1907-1975). Both had strong connections with New England, both remained within a non-avant framework creatively throughout their lives, Fairfield with realist representation, Quincy with a neo-classic style, both had suffered something of a reputational eclipse by the time they were in late maturity, both had something of a pastoral quality to their work, and both perhaps are re-gaining more recognition now than in the immediate period following their deaths. Quincy studied with Horatio Parker at Yale, who also taught Charles Ives years before. He then went on to learn from Vincent d'Indy in Paris. His music output puts him in with the second generation American contemporaries Harris, Hanson and Sessions, only perhaps much more firmly neo-classical than the others. Yet there is something modern sounding about his music nonetheless. 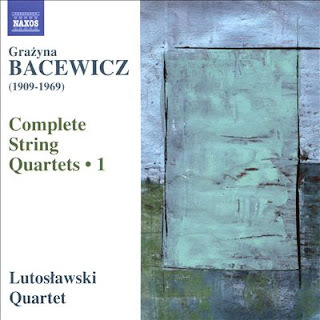 A recording of his String Quartets Nos. 5-8 (Naxos 8.559781) has been reaching my ears for a few weeks, as played very capably by the Ives Quartet. Apparently there was an earlier volume that came out some time ago that I missed, but the works contained in this volume, covering the period of 1935 through 1950, gives us a generous and enjoyable portion of his work in the medium. The four quartets represented in this volume have a very well-crafted, mostly sunny dispositioned balance to them. They show off Porter's intimate familiarity with the string medium (he was a professional string player for a time) and his talent for creative, rhythmically vital and melodically sophisticated music in this realm. 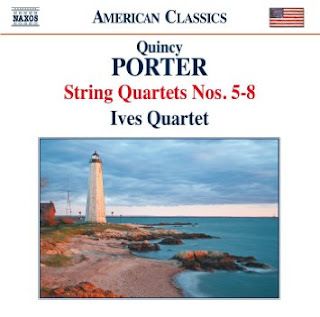 All four quartets are masterful examples of Porter at his best. They are not gushingly romantic nor are they wildly modernist, but they have a sort of "American Gothic" charm without having recourse to folksong structures or anything much in the way of referential Americanisms. The harmonic movement throughout the works is often more 20th century than not, though unambiguously tonal, which gives the music a kind of crisp edge to it, a contemporary quality. From the vantage point of today they hold up remarkably well, sounding neither archaic nor anachronistic, but rather very much a product of their time period. He used classical forms but never resorted to an imitation of the old masters, at least not here. The Ives Quartet does a bang-up job and the music has an energized freshness that many will gravitate towards, I would think. Highly recommended. The Polish modernist art song finds beautiful expression on a CD by soprano Agata Zubel and pianist Joonas Ahohen entitled Dream Lake (Accord 216-2). On it we are treated to two song cycles: "Chantefluers et Chantefables" by Witold Lutoslawski (based on poems by Robert Desnos, arranged for soprano and piano by Eugeniusz Knapik) and "Seven Shakespeare Sonnets" by Andrzej Czajkowski. Robert Desnos submitted his manuscript "Chantefluers et Chantefables (Song-Fables for Good Children)" for publication right before his arrest by the Gestapo in 1944. Lutowslawski selected nine poems out of the 80 in 1990, originally scoring them for soprano and small orchestra. The Knapik arrangement brings the essence of the music to the forefront, and the accompaniment in the hands of Joonas Ahohen has great poetic grace. Aata Zubel is marvelous in her performance, with a unerring sense of pitch, a beautiful, dramatic sense of tone, in line with the very best modern vocal performances I have heard. The melodic poignancy of the music is given a near perfect realization. Similarly Andrjez Czajkowski and his "Seven Shakespeare Sonnets" fare especially well with the duo's renditions. Czajkowski (known in the West at the time as Tchaikovsky), had great renown as a concert pianist beginning in 1955, ultimately leaving his native Poland for good. He was torn between his role as concert pianist and his inner need to compose. The "Seven Sonnets" were written in 1967. Like the Lutoslawski cycle the music is firmly modernistic and deeply singular. And as with the first cycle Ms. Zubel performs her parts with tremendous musicality and expressivity. Ahonen gives us atmospheric readings that meld with the exceptional soprano sonics for an unforgettable result. The combination of late high-modernist masterwork lieder and superb performance make this a recording of special merit. Aata Zobel is a true phenomenon and Joonas Ahohen her near-perfect foil. Strongly recommended! Some works are deep, complex, they defy simple explanation. They are more than what they do exactly. 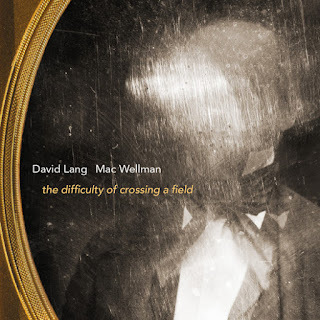 This is the case for the chamber theater-opera work The Difficulty of Crossing A Field (Cantaloupe 21107), with music by David Lang, libretto by Mac Wellman. It is scored for string quartet, a small chorus (in the Greek dramatic sense as well as the current musical sense) and vocal soloists, most of whom have both spoken and sung parts. The original performance took place in 2002 with the Kronos Quartet as the instrumentalists. This recording replaces them with the Harlem Quartet, who sound quite good. The libretto is both matter-of-fact and esoterically allegorical, surreal. It deals with a plantation in Selma, Alabama at a time presumably just before the Civil War. The plot involves the owner-slaver, a Mr. Williamson, his wife, daughter, neighbors, a judge and the 14 resident slaves. One day Mr. Williamson disappears into thin air while walking across a field in plain site of a number of witnesses, including some of the slaves, the wife and daughter, etc. There is the plain, factual element of the disappearance, as in part reconstructed in the court hearing after the fact. But there is an ominous, symbolic, extra-reality/super-reality part of the work, a mood the music and libretto capture well. The daughter just before the incident recounts a vision she had about "right and wrong," about the "mystery of Selma, Alabama" and how Mr. Williamson needs to "talk to the horses." The sub-human nature of slavery is brought out in part by the names each of the slaves has been given, about the "rules" on how to oversee slaves, and the slaves as outside of the workings of local society, underscored by a prohibition on slaves bearing witness in any court. There is much more to the plot than that, but you must listen to the work to get the full gist. The disappearance of Mr. Williamson is an allegory to the end of slavery, abolition, the end of institutionalized agri-racism. And it is movingly done. There are important spoken parts, sung parts and a key role played by the string quartet. What impresses for one thing is the dramatic and musical excellence of the player-singers. They convince in their pacing, their inflections, and in the total musicality that Lang gives to us and they execute with dramatic dedication. There are minimalistic elements strongly present in the score, as one might expect of David Lang circa 2002, but the repetitions are put to use to establish mystery and ominousness more so than trance or mesmerization. And there are linear elements, too. This is a haunting, moving work that stands out in the mind long after you have heard it. You should give it a close listen. The melding of libretto and music is total and powerful. And it captures a societal way of life, a system on the verge of collapse in ways that are both strong and poetic. 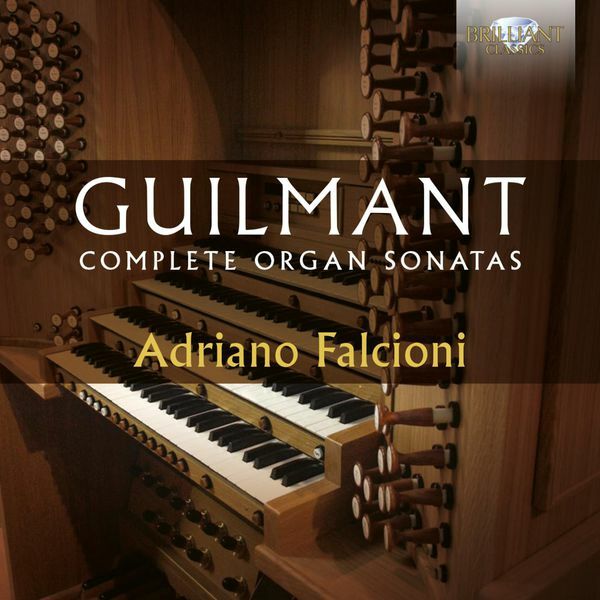 Felix Alexandre Guilmant (1837-1911) is a lesser-known composer of the French Organ School. Widor and Tournemire were his contemporaries. Like them he took his cue from Franck in developing a sprawling symphonic organ style in keeping with the modern developments in cathedral organ capabilities. His music reflects German late romanticism, harmonically Wagnerian and Franckian, technically influenced by Chopin and Liszt, and showing a sympathy towards Mendelssohn and Schumann. That according to the liners. I also hear a bit of Bruckner's gigantism and light-heavy motion, especially in the couple of scherzo movements. He embarked upon a career as virtuoso organist, landing a position at La Trinity church in Paris and succeeding Widor as professor of organ at the Paris Conservatoire. 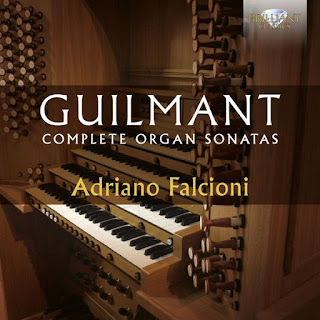 The 3-CD release Complete Organ Sonatas (Brilliant 94227) covers all eight of his works in that vein, played ably and idiomatically by Adriano Falcioni on an 1897 Carlo Vegezzi-Bossi at Sacro Cuore Church, Cuneo, Italy. This is inspired music in the grand symphonic tradition. If it does not have quite the amount of dash of the Widor symphonies, nor as much mysterium as with Tournemire, the music nonetheless holds its own in very appealing ways. Anyone who revels in the grandeur and sweep of the French School will find this a welcome addition to their collection. Those who are not as familiar might start with Franck, Widor and Tournemire. The performances are first-rate, the sound quality excellent. The Brilliant price is right and there is much to enjoy here. The world of emerging new music composers continues to grow. There are now a good number who espouse a new classical modernism built of post-modern, sometimes radical tonal elements that point to early music and modal forms not strictly minimalist nor quite beyond it altogether, in that there is more in the way of repetition, but usually more in the nature of an ostinato. Arvo Part has been a model composer in the past decades with an influence that has freed composers from restraints of modernist practice or neo-classicism per se. All of this exists today in a pluralist world that includes extensions of modernism and both neo-classic and neo-romantic camps. 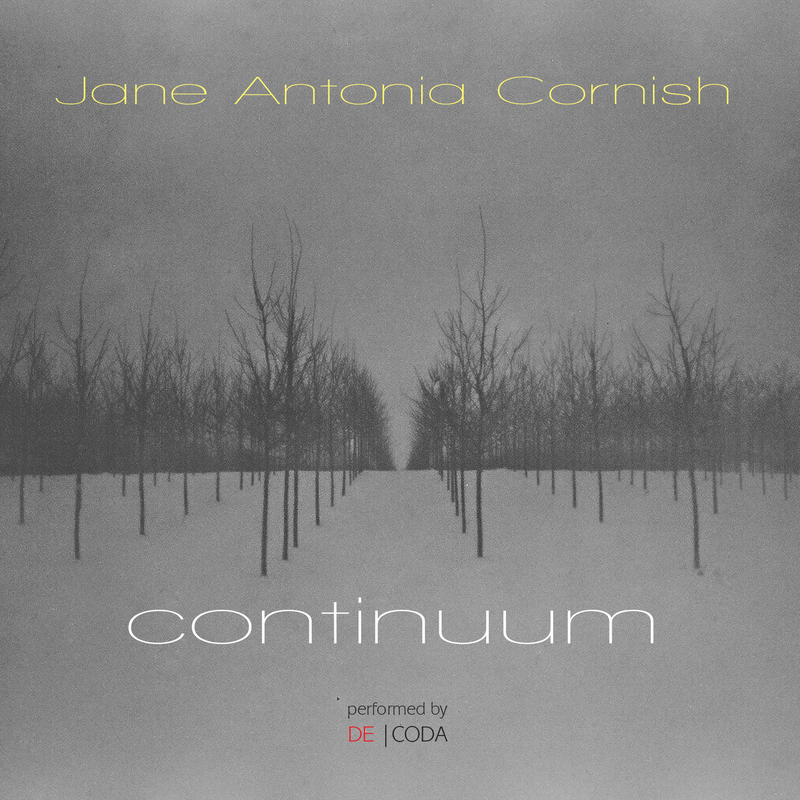 Jane Antonia Cornish, British-born New York resident, most certainly qualifies as one of the post-modernists, a rather important one, judging from her recent release of chamber works entitled Continuum (Innova 923). She is known for her lushly atmospheric film soundtracks. This is her second release of chamber works, following upon the heels of the acclaimed volume Duende (see my post on that release from May 7, 2014 on these blog pages). The Carnegie Hall affiliated group Decoda does an excellent job performing the seven works presented on Continuum. "Nocturne I-III," "Continuum I & II," "Portrait" and "Tides" make up the program. Strings are at the forefront. The three "Nocturnes" feature a cello quartet, the two "Continuums" and "Tides" are scored for two violins, four cellos and bass guitar, "Portrait" is for solo cello. Much of the music is built upon repeating chord progressions with variations and counter figures, a little reminiscent of the baroque variations built on the theme of "La Folia," yet quite different in sound and result. There are often enough broken-chord string arpeggiations, and generally a full, warm sound both atmospheric and lyrical. "Portrait" concentrates effectively on arpeggiations. "Tides" contrasts open-fifth and more complex oscillations in the violins with contrasting cello-bass guitar chord clusters to musically model the idea of shifting wave cycles. The music builds into what becomes climactic chordal swells that more adherently alternate between violins and cello-bass to create a sort of natural steady state, which then transforms into an ever-more gentle cello chordal sounding. All told Jane Antonia Cornish gives us some very evocative and lyrical music that is neither quite linear nor cyclical, but instead utilizes the two together to create memorably poignant sound structures. She deserves your ears, certainly, on this one. Both Continuum and the earlier Duende show us a composer of great promise, with a haunting spatiality, and a primal yet complex sense of sound. Definitely recommended! When we have the benefit of hindsite, we can see relationships between very different schools of composition, and of course still experience the uniqueness of each work. This comes nicely to the forefront with Russian pianist Alexei Lubimov and his worthy release Ives-Berg-Webern: Concord (Zig-Zag Territories 362). The pioneering American Charles Ives and two of the "Second Viennese School" composers, Berg and Webern, both contrived a world of modernity without knowledge of one another, as two isolated camps. Ives created the fantastically ambitious "Piano Sonata No. 2, Concord, Mass., 1840-60" during the period 1911-15; Berg wrote his "Piano Sonata Op. 1" in 1908, a few years after embarking on an important period of study with Schoenberg; Webern wrote his only work for solo piano "Piano Variations, Op. 27" somewhat later, in 1935-36. They all converge with a break from romanticism per se and a highly developed choice of notes beyond conventional harmony. Yet the Viennese composers and Ives came to it all independently. By the time Webern wrote his work his development of an abstracted, disjointed style was complete. Webern's influence was paramount of course in the high modernist world of serialism. But as most everyone knows Ives and Berg were highly influential as well in the century that followed, though for a time the influence of Webern triumphed as the father of high modernism in the period of, say 1950 through 1970. All three composers have foundational status as we look back today. Alexei Lubimov has by virtue of his Russian background the ability to see all three works from a perspective more removed from nationalist concerns and so is able to look at the music freshly. Hearing his readings of the works all together in this release allows us to savor the subtle and sometimes dramatic differences and feel the convergences. The Berg and the Ives seem closer in the end to each other than to the Webern. There is a rubato openness in each of the works and an advanced tonal broadening. Yet seen from another perspective, Ives contrasts dramatically from Webern and Berg in his intertwining of and reworking of hymns, marches and the "fate motive" from Beethoven's Fifth. In that he was as much a father of postmodernism as of modernism. All that is what makes the juxtiposition so interesting. If you sometimes hear a Scriabin influence in Berg and Ives, that is another aspect of convergence that no doubt was all about something being "in the air." Lubimov helps us to hear that element perhaps a little more clearly because of his roots, one might suggest. In the end though it is Alexei Lubimov's supreme interpretive sensitivities that make all three works sing with lucidity, to speak to us today not in some shocking sense, but as music that we can understand readily, get inside of and respond to. It is music we now have a good deal of kinship with, after a century of exposure to the broadening modernity that lives in the present today but percolates back to these seminal piano works. 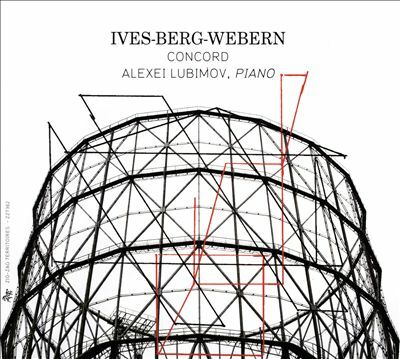 Ives, Berg and Webern get in Lubimov's readings the very expressive treatment they deserve but also a very coherent sense of flow. For all those reasons I do not hesitate to recommend this CD to you, whether you are very familiar with all three works or come to them with new ears. Well done, Maestro Lubimov! Pittsburgh-based, Croatian-born composer Zvonimir Nagy writes music based on a personal harmonic system that has to do with the cognitive affinities of tone. His CD of compositions for solo piano, Vestiges (MSR 1515), presents nine of his works written between 1998 and 2010. They flow together in evocative and sometimes rather mysterious modern ways, showing a dramatically expressive cast that recalls Scriabin and Messiaen perhaps, a hint of Stockhausen perchance, Ives possibly, but only as stylistic touchpoints. Nagy has an originality and a pronounced presence that belies influences and goes a good way to giving the listener something with its own aesthetic unity. The piano performance duties are divided into three: Geoffrey Burleson, Mabel Kwan and Nagy himself. Each shows a sensitivity to and affinity towards Nagy-ian sound worlds and so all comes off quite well throughout. The use of the sustain pedal and a prominent presence of space makes for atmospheric, sometimes meditative sound universes. Melodically the music dwells on an abstract level that does not show conventional song-like symmetry so much as it unfolds with a sort of modern naturalism. All nine works together give us a program that leaves us with a unified impression, even though there are alternating moments of quietude and those of rather turbulent activity. I found the whole CD highly interesting, very colorful and a definite advance in the modern realm of solo piano works. Take the plunge and check this music out. With the requisite attention it will take you to interesting places both far away and deeply near. Definitely recommended! With the incredible development of classical modernity in the 20th century and its continuation-aftermath in the late 20th and early 21st centuries, we have accumulated a formidably vast body of works that we continue to learn more about . . . virtually every day. There are so many composers, so much that remains outside the standard repertoire. A dedicated listener has a wealth of music to draw upon, a significant body of musical riches to explore. A single lifetime is hardly enough to contain and assimilate it. Argentinian composer Alberto Ginastera (1916-1983) is an excellent example of someone many of us still need to get to know better, unless you are an expert on 20th century Latin-American classical. A very good CD of his piano works is now available, as played with great dash and spirit by Francois-Xavier Poizat. 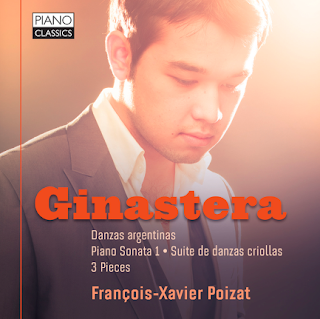 It includes Ginastera's Danzas argentinas, his Piano Sonata 1, etc. (Piano Classics 0087). It is a great place to make the composer's acquaintance, or to become more familiar with him if you already know some of the music. It shows us a musical original filled with tremendous rhythmic vitality, great melodic charm, and a dazzling pianistic brilliance--all brought out well by Poizat. There are dance-originated works which go beyond typical traditional bodily movement into pure instrumental brightness. The "Danzas argentinas" and the "Suite de danzas criollas" are exciting examples. There are the more purely pianistic realms of the "Piano Sonata 1" and "3 Pieces, op. 6" which retain the rhythmic vitality at times but also branch into a sort of modern lyricism as well. 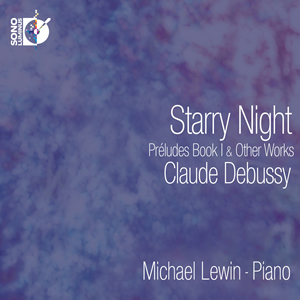 You can hear the influence of Stravinsky at times, only transformed utterly into very original and Argentianian-rooted piano music that breathes with life and energy, dynamic drive and lyrical depth. A brief "Prelude No. 5" by Federico Mompou ends the program. It is a kind of encore that has introspection and a pronounced Spanish flavor. It caps off the CD nicely. In short, Francois-Xavier Poizat has chosen some very vibrant Ginastera and plays it all with a very proper mix of drive and subtlety. It is a rather fabulous program, with much that is unforgettable on very vital levels. Poizat clearly has a very pronounced affinity to Ginastera's moods. The performances are impressive and breathtakingly alive. Strongly recommended. The classical guitar does not dominate the modern classical worlds, compared to the piano or the violin. Those who write for it (but do not specialize in it) tend to do so out of a fascination for the possibilities more so than an expectation of immediate acceptance and widespread performances across the concert stages of the world. Toru Takemitsu and Hans Werner Henze come immediately to my mind as having written some notable chamber works for guitar and other instruments. There have been others of course, some quite prolific. Then there is contemporary Russian composer Sofia Gubaidulina (b. 1931). Thanks to a new release we can listen to her Complete Guitar Works (Naxos 8.573379). Her output for the instrument is not vast, and can easy fit the length of a CD. Stephen Tannenbaum is the principal guitarist on these works. He realizes the parts carefully and poetically. There are four works at hand, two rather long, two quite short. They span much of Gubaidulina's career, from 1960 to 2013. The two short works, "Serenade" (1960) and "Toccata" (c. 1969) (the latter in first recording here) are for solo guitar and show the composer in a modern-melodic mood, giving the guitarist advanced melodic-harmonic voicings and showing Sofia's special sense of form. They are little gems. The longer works are for guitar(s) in a chamber context. 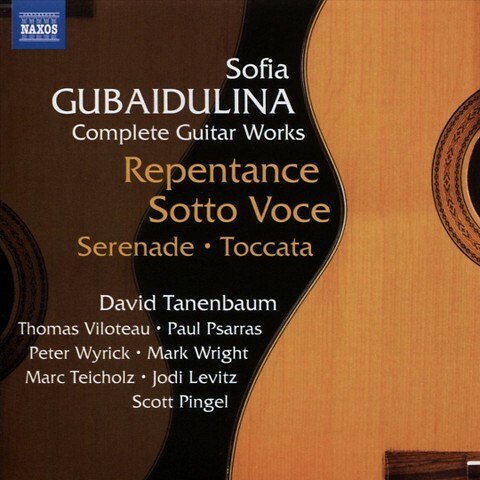 "Repentance" (2008) is scored for three guitars, cello and bass; "Sotto Voce" (2010, rev. 2013) features two guitars, viola and bass. Both works make use of both conventional and less conventional classical guitar techniques, including pulled strings, the use of slide and such. The aim in both works is to create a sensuous sound world with event-clusters of modernity that take full advantage of the special sonarities of multiple guitars playing off the bowed stringed instruments as contrast and confluence. They show Gubaidulina's deliberate, evocative use of harmonic coincidences and sound colors, guitar ensemble versus solo strings, alone and together, distinctively Gubaidulina-like phrases that work together to create episodic periodicities as only she quite can. The works create vivid moods as they take advantage of both idiomatic and modern guitar possibilities and the string writing that tends to be one of her stylistic hallmarks. These are not your typical works for guitar, but they are first-rate Gubaidulina. The performances are very good. After you've listened enough times, the logical but highly original musical mind of Gubaidulina comes through. Do not expect a super-virtuostic guitar music. It is music that is by no means easy to play well, but nonetheless puts the emphasis squarely on musical sequence and sound color. All in all it is some rather remarkable music. Recommended for the modernist as well as the classical guitar afficionado who seeks something very unusual and stirring. 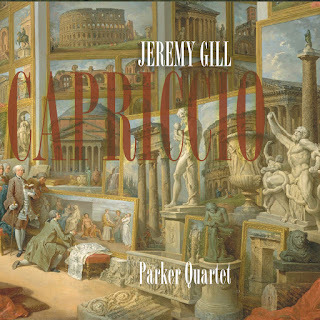 Jeremy Gill's Capriccio (Innova 913) makes use of a very wide world of string quartet techniques in succession, running the gamut from harmonics, open tuning, microtones, glissandi to you-name-it in an ever-shifting stylistic universe touching on a vast spectrum from the ultra-modern to early music and pre-modern, post-modern and polyglotten. 27 miniature movements occupy nearly an hour of performance time as the Parker Quartet negotiates the labyrinthian twists and turns with terrific spirit and impeccable technique. The composer suggests that the work was meant not only for the concert setting, but also as a pedagogical demonstration of the myriad possibilities the string quartet affords technically and sonically. 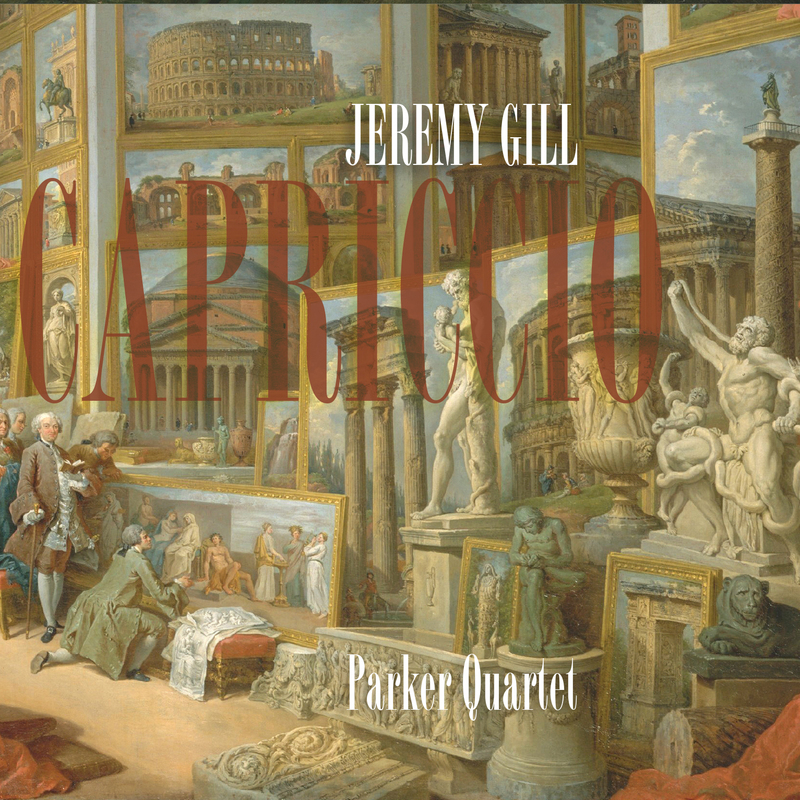 In the hands of the very talented Parker Quartet that certainly makes sense, though as pure music it has such strong episodic qualities that one can safely ignore the technical and gain much from just sitting back and experiencing the flow of vivid ideas. Like Crumb and Ligeti before him, Gill's writing has a vivid abstractive narrative, evena-mental quality. There is of course no literal program nor need there be one, unless you consider the whirlwind trip through a vast array of approaches a sort of story, which of course in a way it is. In the end it is a tour de force of brilliant miniature compositions, relating one to another like the infinite variety of snowflakes descending onto earth during the first snow of winter. Like each flake, one segment relates to the others yet is in its own form as a distinct part of it. It is also a wonderful showcase for the Parker Quartet, who excel in producing dramatically pronounced differences and contrasts with a surety of the very best. By the vivacity of each part and the experience of the ever-shifting whole one is captivated and endlessly stimulated. In the process Jeremy Gill conveys to us his own special sensibilities as a composer of almost unlimited breadth, a master stylist who knows virtually no boundaries in his poetic collocation of past, present and future into an hour of quartet fireworks and fantasia. 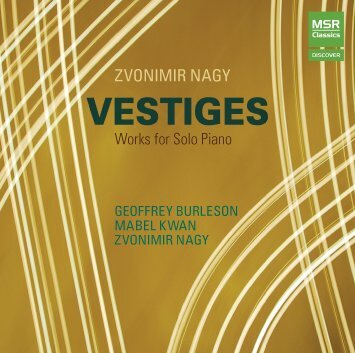 An unusual 2-CD compendium of solo piano music is up for review today. 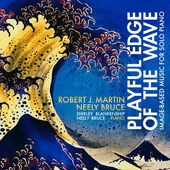 Playful Edge of the the Wave: Imaged Based Music for Solo Piano (Ravello 7909) features four suites of modernity-saturated piano miniatures, as performed nicely by Shirley Blankenship and Neely Bruce. The centerpiece of the set, by Robert J. Martin, is the title work "100 Views of Mt. Fuji: 100 Pieces in 100 minutes--Homage to Hokusai." Each of the very brief works is based on a collection of classic Hokusai woodcuts called "One Hundred Views of Mt. Fuiji." Each has a visual aspect of the woodcuts in mind . For example, there is "Breeze Dancing Across Water" from the "Wind" series. This work along with the others has a matter-of-factness, a primal immediacy, like "Chopsticks" in its there-ness only of course much more sophisticated and modernistic. Complementing the main work are three others: Martin's "Stone & Feather," studies on timbre and space conveying images of lightness and heaviness. Then there are "Improvisations" and "Homage to Seb," both by Neely Bruce. The former are a series of 13 free improvisations Neely recorded after a session devoted to Charles Ives' Songs. The improvisatory pre- post- or interludes are each named after phrases in Ives' song texts. "Homage to Seb" pays respect to Johann Sebastian Bach by liberating examples of the master composer's dissonances from the original compositional contexts, then reordering them arbitrarily and composing chromatic figures around them from notes not a part of the dissonant passages. The result is Bach as high modernist, or rather Neely Bruce in this guise, since the end-result is of course his. There is no one description that comes to mind of the many short movements that comprise this set, except that a visually oriented approach is the norm, that the music is both sophisticated and primal, and that the music has a visceral immediacy that is in-the-moment and not tied so much to formal, long-form structures. For all that we get a very refreshing disencumberment from the conscious large-scale and instead get a voluminous series of moment-images, each different from the other like the framing of seen images or aspects of them differ one from another. It is a very adventurous set, unpretentious and direct, but ultimately rather profoundly so.